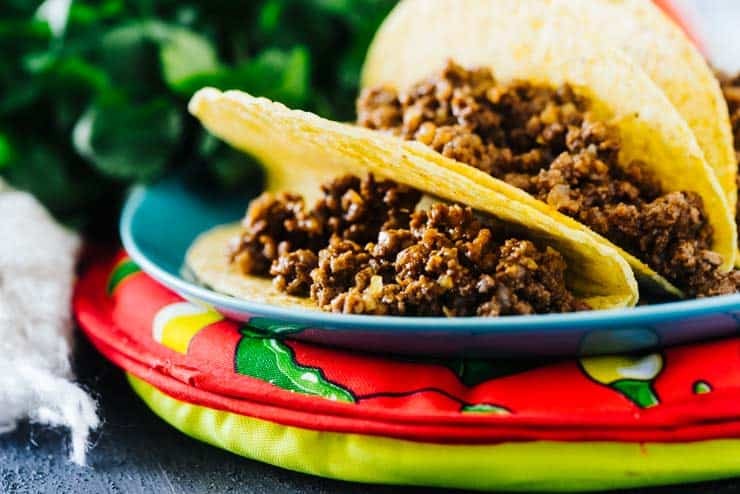 Mexican Style Ground Beef Recipe-- Saucy and flavorful without the mix! 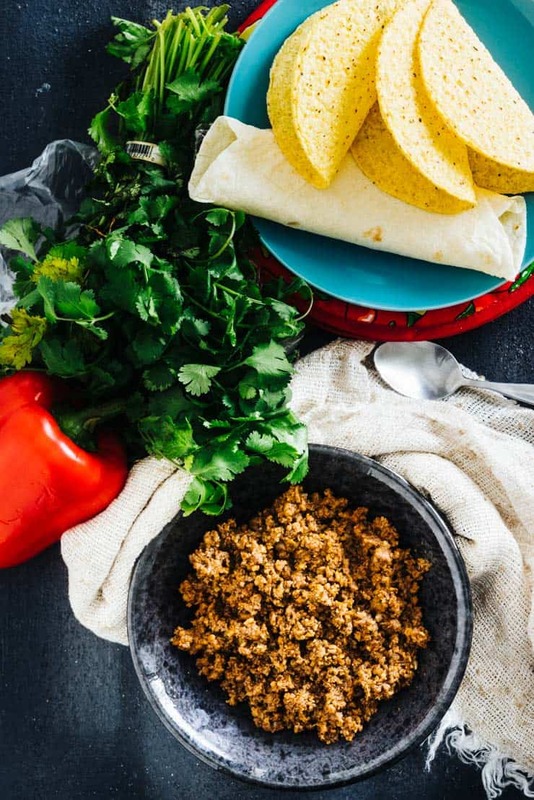 Today I’m sharing one of my favorite quick and easy recipes– Mexican Style Ground Beef. It’s the recipe I reach for most often when we’re making ground beef tacos or burritos. It’s full of flavor, saucy, and not much harder than reaching for the taco seasoning. 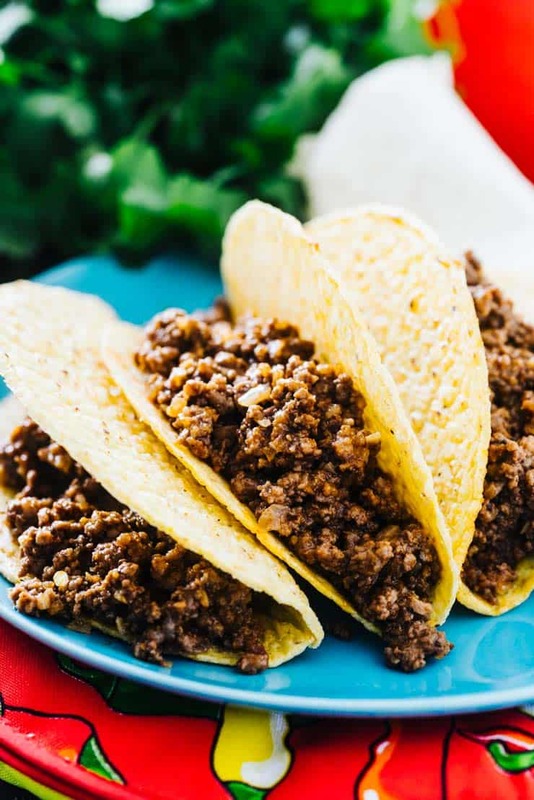 If you’re tired of reaching for the Costco-sized container of taco seasoning everytime you want Mexican ground beef for tacos, enchiladas, or nachos, you have to try this recipe! I know I’m guilty of going the easy route, too, but this recipe is really not that much harder than stirring in premade seasoning. 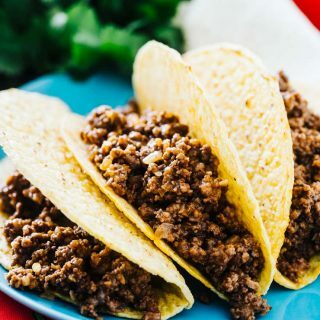 It is perfect for a myriad of Mexican ground beef recipes and tastes so much better than anything you can shake out of a canister. My Mexican style ground beef recipe uses green enchilada sauce, paprika, chili powder, cumin, and dried onion. If you like it on the spicy side, feel free to add a bit of cayenne or ground chipotle chili powder. Ever wonder why some taco meat found at restaurants or in chili is ground SUPER fine and how they get it that way? That is the result of actually boiling the hamburger first. This method of cooking brings the temperature of the meat up slowly and prevents it from clumping, keeping it finely ground. If you’d like to try this method with this recipe, place the beef in a deep pan and add enough cold water to cover the meat. Slowly bring the pan to a boil, stirring often to separate the meat into small crumbles. Once it’s to a boil, reduce heat to a simmer, cover and cook until the meat is brown and fully cooked. At this point, you’ll drain off the water and add the remaining ingredients to the meat, following the recipe card below. Want recipes to use Mexican Ground Beef in? Lodge 10″ Cast Iron Skillet: Cast Iron Skillets are your BEST friend and are totally underrated. Cast iron retains heat really well and allows you to get that irresistible sear on steaks and other meats you can usually only get at a restaurant. Pair this with the fact that they are CHEAP it’s a no-brainer. Chop Stir: This strange little tool makes short work of browning ground meat with its odd shape that allows it to crumble the meat quickly as it cooks. 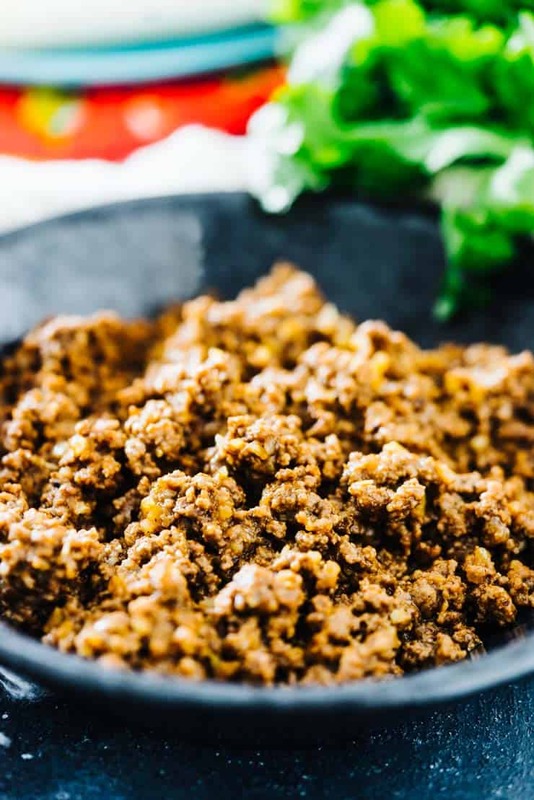 Today I'm sharing one of my favorite quick and easy recipes-- Mexican Style Ground Beef. It's the recipe I reach for most often when we're making ground beef tacos or burritos. It's full of flavor, saucy, and not much harder than reaching for the taco seasoning. Heat a skillet over medium-high heat and brown and crumble ground beef until no longer pink. Drain excess fat. Return meat to pan and add remaining ingredients, stirring to combine. Let simmer for 5-6 minutes over medium-high heat or until most of the liquid is absorbed and it’s the consistency you like—for instance, I like my taco meat a bit drier than I do for making nachos or enchiladas with. This looks so good! I knew I wanted to do Mexican today, but didn’t have any new ideas. I don’t have green sauce in a can, but have green chilies and alot of spices. I don’t mind more steps. Have you ever made the sauce from scratch? Made this last night. It was delicious! Thank you! just to clarify, does this recipe use red or green enchilada sauce? the recipe reads green, but the link attached to the green enchilada sauce is a recipe for the red kind. Yes, I use green enchilada sauce. My recipe card sometimes pulls links incorrectly. Sorry. Thanks for checking!